This past weekend we had the modern equivalent of a barn raising - a family fence raising for my brother-in-law. Fences are like evil spells that are cast upon a home - full of mystery and pain. Whose fence is it? No one knows. Who is supposed to pay for it when it falls down? No one knows. The person who finally caves first to the expensive, time consuming and painful spell gets pathetic revenge by putting the "pretty" side of the fence facing their yard. It's a small comfort though. No one gets joy from these wood fences. They are ugly at best and just a necessary evil. So anyway, my in-laws came in to help build the fence and we went to dinner afterwards. And even though there was fried shrimp, fried green tomatoes, fried okra (gross) and fried everything else, somehow the topic turned to food. My father in law and I discussed eggs. We both had eggs every day for breakfast growing up and both consider them to be the world's most perfect food. I honestly could probably eat only eggs most days. My mother made eggs a few ways that I loved. Egg in the hole (newsflash - Pioneer woman didn't invent that), plain fried eggs (still a staple for me to this day, especially now that I've perfected cooking them on parchment paper and don't even have to wash a dish afterwards) and honestly - my favorite way - something that I call egg hash. She cooked a soft boiled egg, and chopped it up into crispy, shredded buttered toast. I LOVED that dish. I credit that yumminess as being the reason I am a morning person. It's DELICIOUS. She always salted and peppered it perfectly - something that I find truly lacking in restaurant eggs. There is nothing grosser than a breakfast taco with unseasoned eggs in it. EGGS NEED SALT. Jennifer McGuire changed my life when she introduced me to this amazing egg cooker. I didn't know why she was so excited about it until the first time I used it. 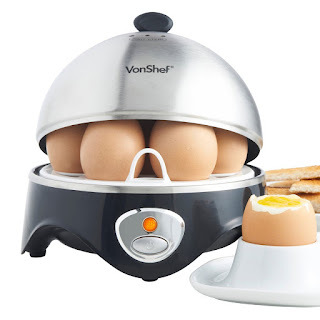 I am generally anti-appliance, but I will run out of this house in a fire with this amazing egg cooker. You set the doneness of the eggs with the amount of water you use, and it's always perfectly done if you're doing one egg or seven. They peel like a dream without all the rigmarole of boiling the eggs. It has made making that childhood favorite a joy. ANYWAY - this is all leading to my great idea. Some days none of us want to adult. We just want to have our moms make breakfast for us and have other people making all of our decisions. Especially the ones that result in laundry being folded and put away. So I was thinking with America's growing older population, and the rise in services like Instacart, Hello Fresh, Plated, and other services which generally indicate our inability to do anything our parents did to maintain our households, that we could come up with a new service, where we pay America's grandmothers to come over and make our breakfasts, lunches, and the pie crusts and bread none of us have time to make. Let's face it - they are more skilled. And they have tons of free time! And grannies like money too! Let's get together and have a winning combination where grannies get paid for what they do best, and we can stop telling ourselves that a Tootsie Pop and coffee is a good start to the workday. I think I'd call this service Granny Grub or something equally cute. And let's face it - while she's there making you breakfast I BET she won't be able to stand the unfolded laundry. It will totally be worth the fee plus the accompanying lecture. 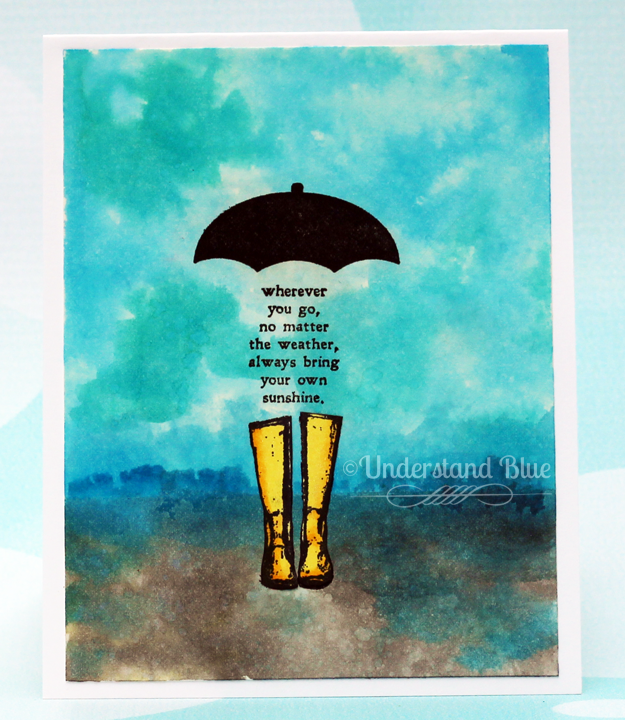 It's a rainy week here with some typical spring weather drama, so I decided to make a rainy card to match. I did a quick video on this background, and how I got the texture at the bottom and the mixing in the sky and at the horizon. You can see it here. I feel like this card subconsciously goes with my egg theme with all that pretty yellow. Please feel free to invest your life savings in my upstart Granny Grub venture. I appreciate you! PS - if you placed an order with me this week and chose "No Contact" - your email address is not shared with me and I can't even say thank you. :( So to the person that placed an order which included Picture Perfect and a French language set - please contact me - I'd love to give you my Picture Perfect Online Class to go with your purchase! PPS - my next retreat is the weekend of July 9th - registration will open soon, and it will fill up fast, so be on the lookout! PPPS - I did a SUPER fun podcast interview with Amy Kunkle from Crazy BeYOUtiful about creating community, about working in the craft industry and all sorts of other topics here. I think you'll enjoy it as well as her other podcasts - she has a great conversational style and a lot of crafty wisdom to impart - this will be a podcast I subscribe to. You can also listen in the embedded player below. i LOVE the idea of GrannyGrub!!! i'd pay to have some really good pie crusts and someone to sweep the dog hair off the floor and do it all with a little TLC! When I retire in a couple of years, I'd love to be one of the granny grub employees! Making bread (and baking anything) is one of my favorite thing he to do! Loved the podcast (and having time to just listen to it while not multitasking)... thank you so much for doing that, and for all the wisdom you share. It was meant to be! Hugs. I love it that you know PS, PPS, etc! Lydia, Your card is beautiful. What kind of watercolor brush do you use? I am so overwhelmed when I go to look for a good brush and have no idea what to purchase. Thanks for you help. Hi RaeDeen - thank you!! I hands down love the Black Velvet Silver Brushes - I order them from Jerry's Artarama - they are wonderful!! LOVE your card - and really enjoyed your video. Now I need that stamp and a MISTI and distress inks. Thanks. Another great post, Lydia! Eggs - check! Granny Grub - check! That sentiment is wonderful and the fact that it comes with boots is icing on the proverbial cake. Wish I could invest in your start up. Alas, since I've reached granny status, I'd be the one doing all the cooking and laundry folding. As I tend to be lazy, that just wouldn't do. I adore this card!!! I'm up for one of your Granny Grub's....Just let me know when you are ready to expand to Alabama!!! Love this card. Your colors and blending are perfect. Thanks for sharing.